Surely you've ever wondered why so much suffering in the world. Yes, our country is now ruled by evil as Satan, who was overthrown in our country. He is here to lead the people against God until the Second Coming of Jesus Christ, who makes evil end. 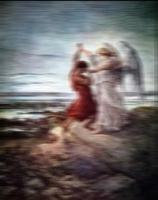 Revelation of John 12,7-9 - The fight occurred heaven: Michael and his angels fought against the dragon. And the dragon fought and his angels, but of no avail. The sky is no place found for them and the great dragon - the ancient serpent called the devil and Satan, who deceives the whole world - was overthrown. He was thrown down to earth and his angels were cast out with him. Lucifer is not a devil with horns, is a highly intelligent being. 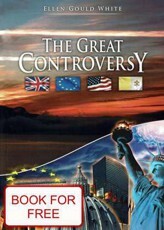 He lied in the heavens and transferred to a revolt by our Earth that lies brought the first humans Adam and Eve. But why suffer and people who believe in God? Matthew 5.4 - "Blessed are those who mourn, for they shall be comforted. Crying about which there is a real pity talking over sin. Jesus said: I call when I am lifted up from the earth, will draw all people to himself (John 12:32). When one looks at how Jesus is crucified on the cross recognizes the sinfulness of human nature. Learns that this is our sin that crucified the Lord of glory, and therefore with a broken heart is crying sins and regrets. Jesus' words but also a message of comfort for people who experience sorrow and grief. Grief does not affect us unduly. Hebrews 12,7-11 - When you run the tests necessary for your education and God to you for acting as their own children. Is there a child who does not punish the father? Education attended by all, without it you would not be his children, half ice. When we weighed their physical parents who raised us, we should rather give in to the Father of spirits and get a life? They're brought up short, at its discretion, but he for our own benefit, to come share in his holiness. Education is at the moment never seems nice, but the cold, but later those who went through it, bringing the fruit of justice and peace. Finally, each test seems to be how hard and bitter, we become a blessing, if you accept it by faith. Any suffering that takes the earthly pleasures, becomes the vehicle for us to turn our thoughts to heaven. Many would not accept Jesus, if he is suffering induce seek help for him. Life tests are God's instruments, depriving the nature of our dirt and inequality. It has pain when otesávají, planed, sanded and polished. It's easy to get to impress the abrasive wheel. But freestone is ready to take its place in the heavenly temple. Master of useless material and pays careful and thorough work. Only a rare and precious stones grind. The Lord helps all who trust him. Religious people achieve great victories. They will learn much. Will experience a great experience. Our heavenly Father never condone those who are experiencing grief. Christ elevates the brokenhearted and crying cleanses the heart, until he becomes his dwelling. Revelation 3.19 - As many as I love, I rebuke and chasten: be zealous therefore, and repent. However, when we shall come to trouble, act mostly as Jacob. (Genesis 32,24-30). We think that all the difficulties, the enemy has a hand in the darkness blind struggle until they exhausted their resources and still not find her solace and deliverance. At dawn, a touch of God appeared to Jacob, who really struggled with - the angel of the contract. Then, weeping, and fell powerless into the arms of everlasting love, to take the blessing, after which many desired. Also, we need to learn that tests are a boon, not to despise God, education, or flagging, when we find fault. Job 5,17-19 - Behold, happy is the man whom God correcteth: therefore despise not thou the chastening of the Almighty: For he maketh sore, and bindeth up: he woundeth, and his hands make whole. He shall deliver thee in six troubles: yea, in seven there shall no evil touch thee. Jesus comes to each sufferer, to cure him. Its presence facilitates the grief, pain and suffering. God wants us to stay in quiet pain, pained heart. He wants to lift his eyes and looked at his dear and loving face. He wants us to grasp the hand, we looked at him in simple faith and allowed him to lead us. His heart feels our pain, sorrows and trials. He loves us eternal love and surround us with their kindness and compassion. We should give more attention to the Lord Jesus, and still think of his kindness. He elevates man above everyday worries and problems, and brings him into the kingdom of peace. 1 John 5,4-5 - Everything that is born of God overcomes the world does. And this is the victory that overcometh the world: our faith. Who is it that overcomes the world than he who believes that Jesus is the Son of God? Faithful must learn humility and trust in Christ and His leadership. Only then will engage with him in the kingdom of God. Hearted man of God "need" to get by with my own self, but tested one understands how weak and releases Christ into your heart. 2nd How to achieve life? AmazingHope.net - Why do the religious people have to suffer?